There was only one reason I wanted to see The Who in concert (once again). Quadrophenia is one of my all time favorite Who records. But, I wondered if the sonic brilliance of that record translated on stage with Pete Townsend's near deafness? Would the onstage production be as overblown as Tommy? Who the hell's gonna sing Bell Boy with Keith Moon dead? Is it worth $26 to see middle-aged rock stars attempting to recapture their glory years? I have to admit that I expected to be disappointed. Especially after seeing their "farewell" tour of 1982 and their "reunion" to of 1989, both of which reeked of money and half inspired performances. The only time I was impressed with them live was in 1980, and they were probably just playing on pure momentum after Keith Moon's death in 1978. Oh well, at least I have my video copy of "The Kids Are Alright" to remind me of the time that they were the best live band on earth. Surprise, surprise, they weren't that bad. The performance was the most inspired since I saw them in 1980, and the sound was clearest of any Who concert I've seen. The narration of the story by Jimmy on video, along with clips from the movie, helped move the story along. 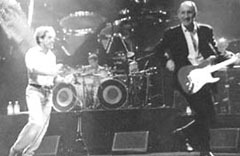 The band applied a "less is more" attitude by using only two walk-on actors. The recent incarnation of the Who seem to have become the employment agency for rock star families. Ringo Starr's son, Zak, drummed and Pete's brother, Simon Townsend, played electric guitar. At least they didn't get Jason Bonham or Julian Lennon. While Tommy's concept of the pinball-machine-playing messiah might be hippie dribble, it had some great sing-along anthems. However, Tommy's songs are more recognizable than the songs on Quadrophenia. The average Joe just wants to hear the "hits" and see Pete do his windmill guitar. Unfortunately, Quadrophenia deals with a uniquely British subject and doesn't translate well to most Americans. The story didn't make full sense to me until the movie came out in 1979. The whole concept of the teenage mod, Jimmy, is too foreign to most Americans, as the mod craze never reached the states. The one thing that Townsend does relate well in the story line is teenage angst. Jimmy's teenage identity crisis is something everyone can relate to. But I think the whole concept of presenting Quadrophenia in its entirety should have been done in the 70's, not the 90's. Pete's "technology finally caught up to us" excuse just doesn't cut it. The Kinks were doing full blown productions of their rock operas in the 70's, complete with movie screens and full acting ensembles. The show did have its low points. At the beginning of the Who's set, Roger Daltrey was doing his trademark microphone swinging only to have it hit the stage. A loud "thud" rang over the P.A. system, but nobody seemed to notice. Roger's voice was very strained, not showing his usual vocal prowess. I kept wondering how he was going to hit the high notes on "Love Reign O'er Me", but he did it (barely). Pete's voice, on the other hand, sounded fantastic. Zak Starkey's drumming was just adequate. He was unable to reproduce most of Keith Moon's frenetic drum style, especially on songs like "The Real Me". You would have thought that someone who had drum lessons by Keith Moon himself (Keith and Ringo were drinking buddies) would have some of his frantic style. And who did "Bell Boy"? One of the walk-on actors sang the song in question, which is the only way you could do it, without Keith. The encore of "hits" was too predictable. John Entwistle's bass solo during "Who Are You" was impressive, but unnecessary, making the show reek of stadium-rock. The acoustic version of "Won't Get Fooled Again" was uninspired when compared to Pete's "Princess Trust" acoustic version. It was probably done acoustic so that Daltrey wouldn't have to do the scream in the middle, which is arguably the best recorded scream on rock record.